Character: A unique toasty blend that goes very well with or as desert. Vanilla lovers will enjoy this new spin on Japan's classic pan roasted green tea. A balanced blend of stem and leaf tinged with vanilla creates a unique toasty blend that goes very well with or as desert. This tea appeals to many for its roasted coffee bean-like taste. 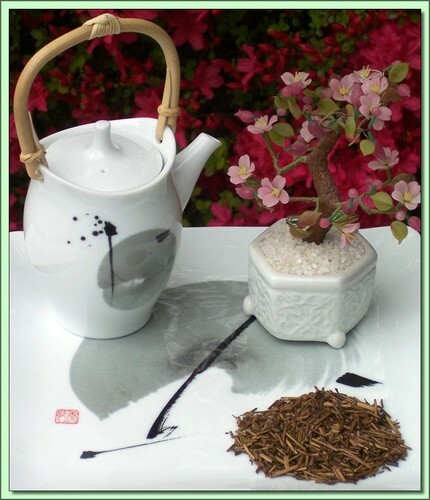 Teas like Houjicha roasted in high temperatures are low in caffeine content because caffeine is released as a gas from solid substances when heated. Produced under ISO 14001 Certified Environmental Management Standards. Hot Tea: This tea is best enjoyed by pouring 190F/90C water over the leaves (1 teaspoons) for 2 minutes (longer=stronger). Don't remove the leaves. Can be infused repeatedly 2-3 times using higher temperatures & shorter infusions until flavor is exhausted.